Chach Hernandez, print service technician, stands with UNT’s new Mimaki JFX200-2513 flatbed UV-LED printer. Bringing jobs back in-house is never a bad thing. For the University of North Texas (UNT) Printing and Distribution Solutions department, the addition of a Mimaki JFX200-2513 wide-format flatbed press in May and a Colex SX-1631 Sharpcut flatbed cutter in July let the in-plant do exactly that, bringing back work lost to overseas printers. For years, hang tags for the UNT Athletics department were outsourced because the Denton, Texas-based in-plant simply couldn’t produce them. Now, the shop can print the hang tags double-sided and cut them on the Colex cutter. The Athletics department loves them because the turnaround time has decreased dramatically, Director Lora Connaughton says. 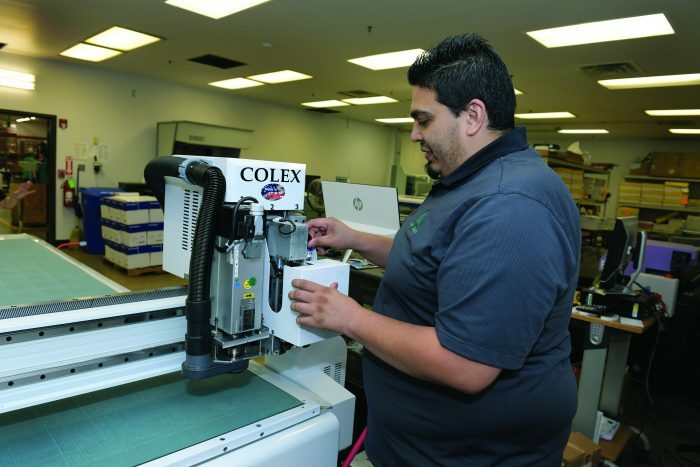 Chach Hernandez runs the new Colex cutter at UNT. UNT Printing and Distribution Solutions has had wide-format capabilities for years, Connaughton says, and “ran the wheels off of” its latex printer. That process often required the finished product to be adhered to a sturdy backing, she adds, whereas the Mimaki can print directly onto rigid material, eliminating a step in the process. With the addition of the new press and cutter, the in-plant can offer a wider array of wide-format products, including pop-up banners, table tents and canvas wraps. Overall, Connaughton says the addition of the Mimaki press and Colex cutter has been effective for expanding capabilities and bringing in more work. To learn more about wide-format technologies and opportunities, attend SGIA Expo in Las Vegas, Oct. 18-20.